Dr. Drakeman has written extensivelycontinues to write and lecture about First Amendment Establishment Clause jurisprudence. Building, but his recent on his insights into how the Supreme Court has relied on the work of Dr. Muñoz and other leading scholars in interpreting the First Amendment,work has broaden beyond the confines of constitutional law, narrowly understood .his most recent His most recent book, Why We Need the Humanities: Life Science, Law and the Common Good, highlights the importance for society of significance of studying the humanities and argues for their usefulness in every professional field. And a true authority on the subject he is. With qualifications ranging from scholar to entrepreneur, his expertise includes politics, law, and public policy, religion, bioethics, and biotechnology, to name a few. He has experienced first-hand how critical the the kind of scholarship and teaching promoted by the Constitutional Studies Program.of humanities is to the greater good of society as a whole, and how the trend of overlooking those subjects is threatening our future. Prior to joining Constitutional Studies Program at Notre Dame, he taught in the Department of Politics at Princeton University for two decades, published Church-State Constitutional Issues: Making Sense of the Establishment Clause, and edited, with John F. Wilson, Church and State in American History: The Burden of Religious Pluralism, and Church and State in American History: Key Documents, Decisions, and Commentary from the Past Three Centuries, as well as numerous articles on religion, law, and politics and immunology. In addition to his academic work, he has beenHe was also involved in the creation and management of several enterprises responsible for important new cancer treatments. In the last few years, Don has also published Church, State and Original Intent, as well as numerous articles on the Constitution in prestigious journals. His publications have won academic awards, and have twice been cited by the Supreme Court. He has also been invited to lecture on both constitutional lawhistory and the role of academic scholarship in public policy at leading universities in the U.S. and Europe. A full list of his publications can be found here. He is a Fellow of the Centre for Health Leadership and Enterprise at the University of Cambridge, and a Fellow of the Royal Historical Society. 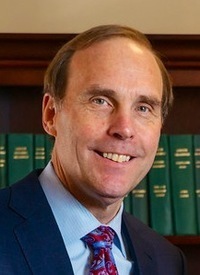 He has also served as a trustee of Drew University, the University of Charleston and the Woodrow Wilson National Fellowship Foundation, as co-founder and Chairman of the Advisory Council for the James Madison Program in American Ideals and Institutions at Princeton University, and as a member of the Advisory Council for the St. John’s Center for Law and Religion. We are thrilled to bring Don’s passionate support for constitutional ideals to Notre Dame. His fervor for church-state scholarship continues to enrich our program. Click here for Dr. Donald Drakeman’s full CV. Originally published by Constitutional Studies at constudies.nd.edu on June 21, 2016.